Today, as US Soccer turned 100 years old, we watched in awe and joy just how far the program has come in the last two decades and how good the men's team can be. The USA dominated FIFA #2 ranked Germany in a 4-3 match that could and should have been a 4-1 rout. It was a performance the likes we haven't seen since that magical game versus Spain in the Confederations Cup 2009. It was a flashback today for the offense. 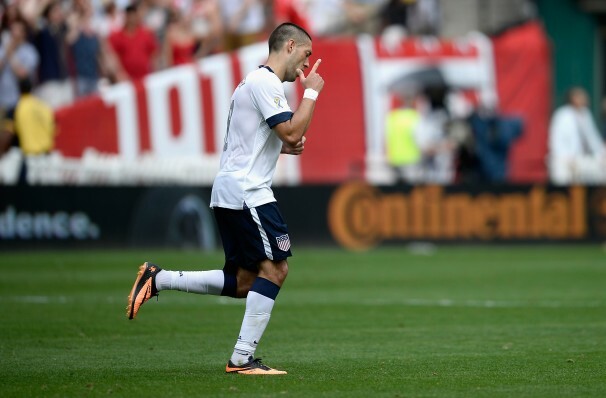 Jozy and Dempsey. A goal for the often-criticized, unjustly categorized as lazy, Jozy Altidore. Altidore had never scored in the run of play for Klinsmann until today. For Dempsey, it was another landmark statement. The Tottenham Hotspur ace will not stop scoring--and looking good doing it--for team or country. Hopefully we will see Deuce suit up in the Champions League before his career starts to fade. For Jozy, there are suitors for his services from Germany to Italy. The defense today was no flashback. Bob Bradley's defensive brain has long been gone in favor of better flank play and a higher line. The lack of experienced centerbacks like Bocanegra and Onyewu have also hurt the defense. Omar Gonzalez, Matt Besler and even Geoff Cameron are still a long way from being in the same position as the Onyewu-Boca tandem. It was curious to see Geoff Cameron in the sidelines but this gave a chance to Evans, who did not disappoint. Beasley seems to own the left back option and Fabian Johnson provided good movement and passing as a winger. The middle of the pitch was well patrolled by Michael Bradley and Jermaine Jones. The two clicked today in their box-to-box plays and covered for each other well. When these two perform, the team is more secure and has more options. The right side had great speed with Graham Zusi and this provided for Altidore's goal at the start of the match. This was the type of service required by him that had always been provided by Landon Donovan. Yes, today USA won without him and it's clear that they can do so from now on. There are options for right midfielder with Zusi, Johnson and Gomez. They may not be Donovan but the chemistry is there. Whether the Gold Cup enables Landon to return to the full national team remains to be seen. What else did we like from today? Fast scoring, quality scoring. Altidore's volleys and Dempsey's long and mid distance shots are highlight-worthy strikes and shows us the growth of US Soccer. It wasn't a cheap goal, a penalty, an own goal. It was great plays, good positioning and the ability to own the field. A flashback, so to speak, to days when the USA could do no wrong and the world took us seriously in soccer.